By this time, Carol had established a successful business career but gave it up to devote himself full time to the practice of Christian Science. A gifted writer and speaker, he became an assistant to Augusta Stetson, a student of Mary Baker Eddy who was at that time pastor of what was to become First Church of Christ, Scientist, New York City, and principal of the New York City Christian Science Institute. 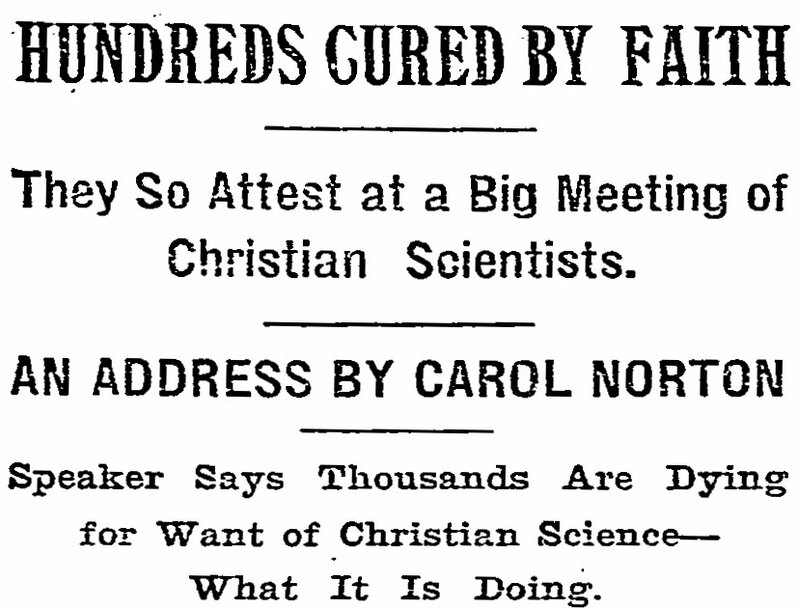 Carol’s name first appeared in The Christian Science Journal of February 1891 as assistant to Mrs. Stetson. 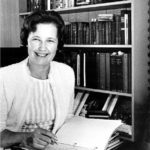 Recognizing his talent and ability, Mrs. Stetson gave Carol opportunities to preach, lecture, and aid in the promotion of Christian Science. She even went so far as to seriously consider adopting him. However, Mrs. Eddy, whom Carol had met through Mrs. Stetson and with whom he established a regular correspondence, foresaw problems arising from Mrs. Stetson’s hold on her young protégé and warned him of her influence. 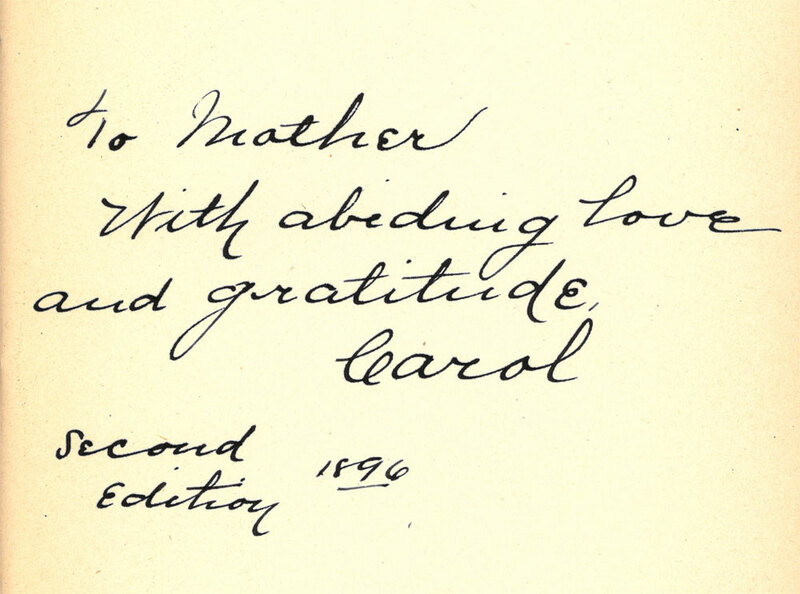 Carol ultimately severed his connection with Mrs. Stetson as assistant teacher and as Second Reader of First Church, New York. Mrs. Eddy greatly valued Carol’s talents, character, and spiritual receptivity. In 1898, she invited him to attend what was to be her last class, held in Concord, New Hampshire. That same year, she appointed him, at the age of 28, as one of the first five members of the Board of Lectureship. His lectures were often standing-room-only events, sometimes held in huge venues, such as New York’s Metropolitan Opera House and Carnegie Hall. 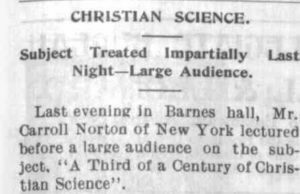 Although over 3,000 attended the Carnegie Hall lecture, on December 18, 1898, only one New York newspaper covered the event. 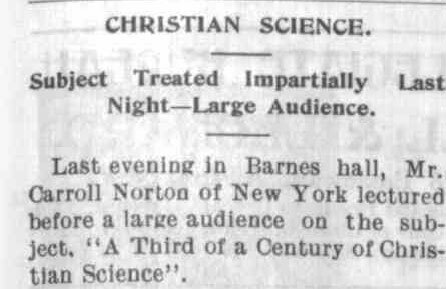 Less than six months later, however, Norton’s appearance at the Metropolitan Opera House, on May 28, 1899, was covered by every major newspaper in the city. 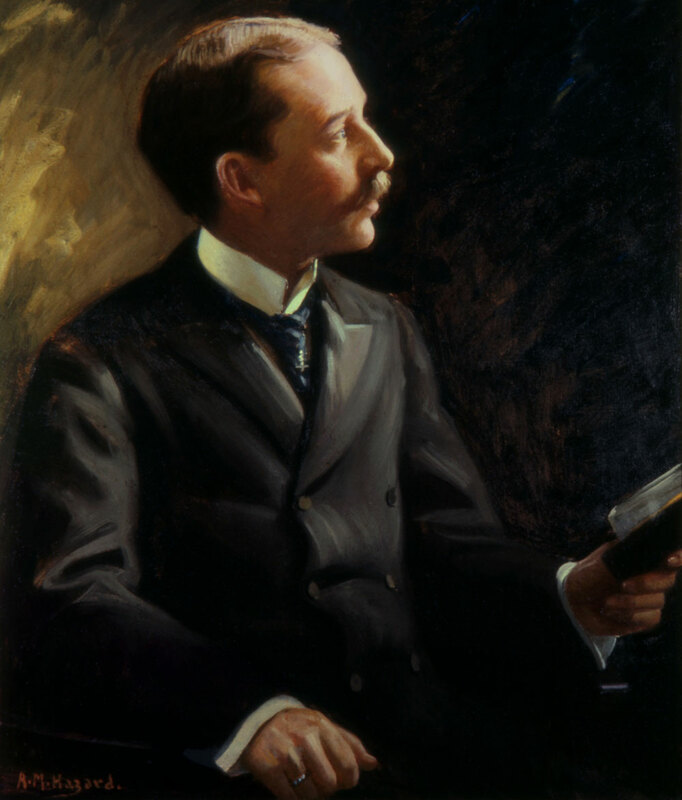 On April 2, 1901, Norton delivered the first formal lecture at a university – Cornell University, in Ithaca, New York. In April 1901, Carol Norton married Elizabeth Griffin of Boston. The couple lived in New York for another two or three years, then moved to Chicago, where, from this central location, Norton continued to serve the Church as a lecturer, traveling as far West as the Pacific Coast. In 1904, Carol Norton was seriously injured in a trolley accident in Chicago. George Kinter, who was serving at the time as a secretary in Mrs. Eddy’s home in Concord, New Hampshire, received telegrams from Christian Scientists in Chicago, desiring to inform Mrs. Eddy as to what had happened. Mr. Kinter, however, was prevented from letting Mrs. Eddy know by the chief secretary (evidently Calvin Frye) who obdurately insisted on obedience to a rule that appeared between 1900 and 1910 on the editorial page of each issue of the Christian Science Sentinel. Around the time of this incident, it read: “The author of the Christian Science text-book takes no patients, does not consult on disease, nor read letters referring to these subjects.”6 Mr. Kinter felt that the rule should be disregarded in this case, but his co-worker was adamant. 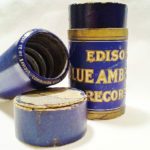 Telegrams continued to pour in, acknowledged only by the secretaries, and Carol Norton passed on unbeknownst to Mrs. Eddy. Carol Norton’s passing occurred not long after he had finally broken with Mrs. Stetson. 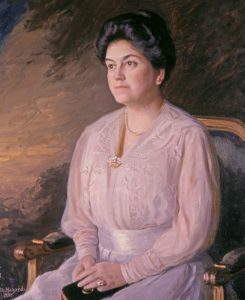 His “pure goodness,” in Mrs. Eddy’s words (see Mary Baker Eddy: The Years of Trial, p. 298), perhaps never fully grasped the extent of Mrs. Stetson’s desire to dominate, although he apparently did come to see something of the dangers of her highly personal ambition. 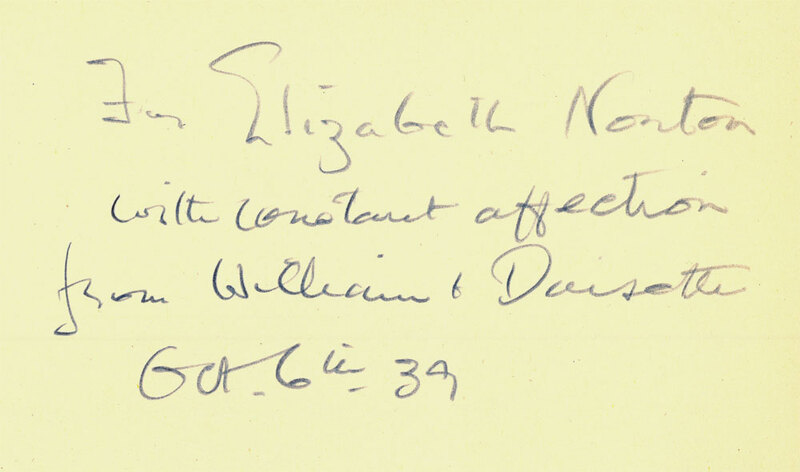 As mentioned earlier, Mrs. Eddy took special interest in Carol, giving him much private instruction, no doubt with a desire to ensure that he had a thorough understanding of Christian Science in its pure form. 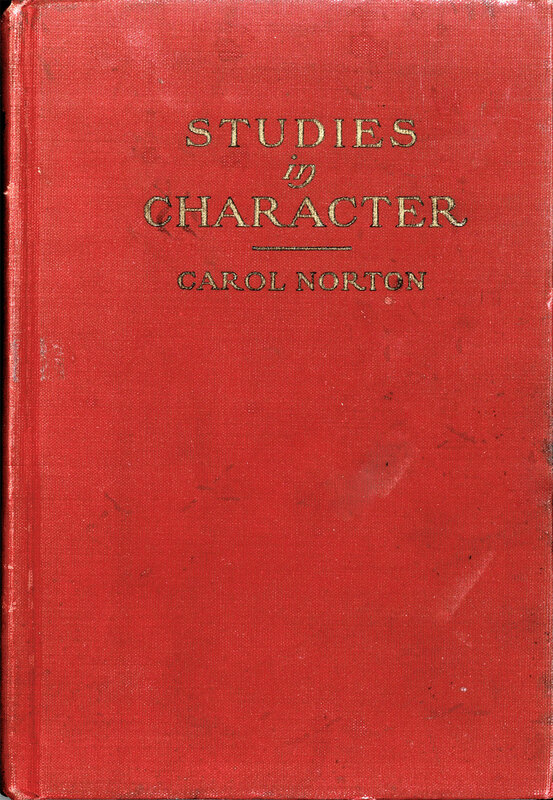 Carol Norton’s mark on the early Christian Science movement is indelible – as a practitioner, teacher, lecturer, church spokesman, writer, and poet. His posthumously published book Studies in Character, a series of articles, some of which originally appeared in the Christian Science periodicals, is a work of keen perception and tenderness – again, particularly remarkable for such a young man. Daystar Foundation reprinted this work some years ago, and it is still available through our gift shop and website. Daystar also sells a reprint of a pamphlet by Mr. Norton – The Christian Science Church: Its Organization and Polity – which discusses the similarities between the primitive Christian church and the Christian Science Church as established by Mary Baker Eddy. Beloved Leader and Teacher: – Please accept my most heartfelt thanks for the degree of C.S.B. which came yesterday. I could not express to you in words my appreciation for all your love and all you have done for me. When expressing gratitude as a child, it was always said to me, “Improve yourself and all the opportunities which are given you, and I shall be repaid.” So now, dear Leader, I am striving to live close to your teaching, praying for meekness, love, and purity, that I may heal the sick, bind up the broken-hearted, and give a correct sense of God’s chosen one. Carol’s little book [Studies in Character] came to me yesterday from the publisher, and I am sending you one by mail. Mr. Norton’s work Woman’s Cause, first published in 1895. 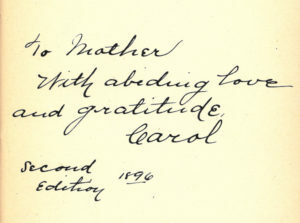 The book’s inscription reads: “To Mother with abiding love and gratitude, Carol, Second edition, 1896.” It would appear to have been inscribed by Mr. Norton to Mrs. Eddy. A 230th edition of Science and Health from 1902, signed by Carol Norton. 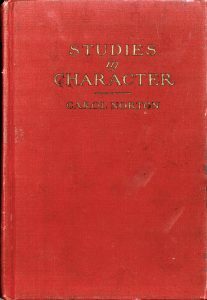 This edition would reflect the major changes Mrs. Eddy made to the textbook in the rare 226th edition, published in January 1902. A 1909 Science and Health. 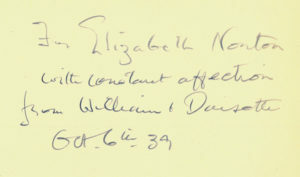 This edition, signed by Elizabeth Norton, includes end pages with signatures of pupils who were in Bicknell Young’s 1910 Normal class, which Mrs. Norton attended. 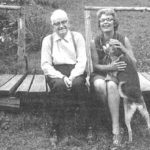 Some of the more familiar names include John Dittemore, Frederick Dixon, Martha Wilcox, Mary Ewing, John Doorly, and Clifford P. Smith. These books and others from the Norton collection may be viewed in an exhibit at Daystar Foundation and Library in Oklahoma City. We hope you’ll visit the library soon to view this and other exhibits, and to explore Daystar’s rich historical collection. “From Unitarianism to Christian Science,” The Christian Science Journal, July 1892, p. 165. 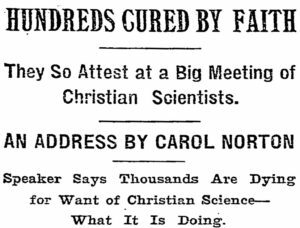 See “Hundreds Cured by Faith,” The New York Times, May 29, 1899; and “Wrath Turned to Praise,” Christian Science Sentinel, June 8, 1899. See The Christian Science Journal, March 1902, p. 728. See, for example, Christian Science Sentinel, January 2, 1904, p. 280. George Kinter reminiscences, quoted in Longyear Museum’s Quarterly News, Vol. 28, No. 2, Summer 1991, p. 425. Studies in Character, pp. 56-57. Christian Science Sentinel, October 6, 1906, p. 89. Quoted in Yvonne Caché von Fettweis and Robert Townsend Warneck, Mary Baker Eddy: Christian Healer, amplified edition (Boston: The Christian Science Publishing Society, 2009), p. 481. 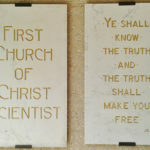 Science and Health with Key to the Scriptures, p. 113.